What Causes Soda Pop to Fizz? And Why Does it Lose its Fizz? 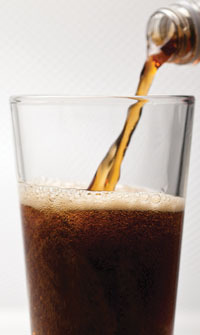 Carbonated beverages are prepared by dissolving carbon dioxide gas in the water that makes up the bulk of most beverages. Carbon dioxide is not very soluble in water and only a small amount will dissolve naturally. This amount is not sufficient to alter the taste or provide fizz. However, if the carbon dioxide is forced into the liquid by increasing the pressure of the carbon dioxide in the container, much more will dissolve. The pressure used is around 100 pounds per square inch. As long as the pressure is maintained, the carbon dioxide will remain dissolved. When the cap of a carbonated beverage is removed, the pressure of carbon dioxide over the beverage is reduced to almost zero. Under these conditions, the carbon dioxide becomes less soluble in the beverage and it will be released. The process of releasing the gas can be slow or fast. Once all of the carbon dioxide is released, the beverage becomes flat and contains about the same amount of carbon dioxide it would if we just allowed the carbon dioxide naturally in the atmosphere to dissolve in the beverage.